The student conduct process is about helping students navigating their way through difficult times as a student at an elite public University. Our process meets the highest standards of fundamental fairness and due process required by law. Our process conforms with Executive Order 1098*. Learn more about the Executive Orders & Title V click here. * In cases involving sexual misconduct, please refer to Executive Order 1097 and the Title IX Website. When the Office of Student Rights & Responsibilities receives a report of a possible infraction, the office notifies the student of the alleged misconduct and directs the student to schedule a meeting with the student conduct administrator. A student may confer with family members, advisors, or attorneys at any stage in the informal or formal process but attorneys are not permitted to participate in a hearing if the matter proceeds to that phase. If a student intends to bring an attorney to any meetings with the Student Conduct Administrator, the student must provide the attorney's name to OSRR at least five (5) days prior to the meeting. At the initial meeting, the student is advised of his or her rights and informed of the evidence supporting the allegation. The student is encouraged to respond and participate in an open and honest discussion of the incident. Possible resolutions to the incident emphasizing the personal growth and development of the student are outlined and are usually determined at this time. In an informal disposition, the student must consent to any imposed sanction. If an informal disposition cannot be achieved, formal procedures commence by providing the student with a written Notice of Hearing as required by CSU Executive Order 1098, Article V, C. The student receives a link to CSU Executive Order 1098, Student Conduct Procedures, describing the applicable procedures. 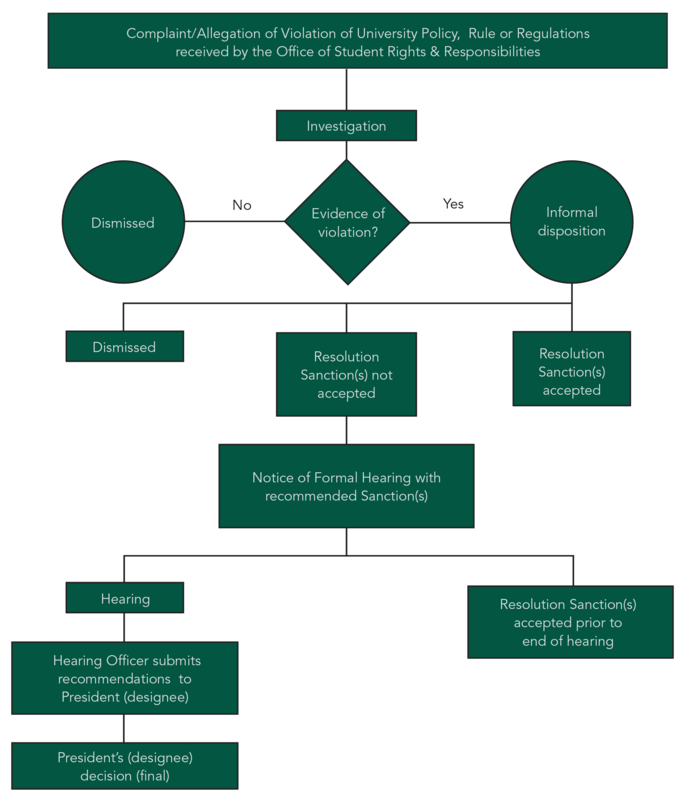 The formal hearing process provides a prompt, fair and impartial resolution of the incident. A Hearing Officer appointed by the Office of Student Rights & Responsibilities conducts a closed, confidential proceeding. The student attendance is not mandatory. Both the student and the student conduct administrator may offer evidence and question witnesses. The Hearing Officer may also question witnesses. An advisor may accompany the student and the student conduct administrator. Student disciplinary hearings are not courtroom proceedings and formal rules of evidence (e.g. hearsay exclusion) do not apply. Written minutes and/or audio recordings of the hearing are kept. After the hearing, the Hearing Officer submits a written report to the University President or designee within ten days. This report contains factual findings and conclusions regarding whether or not the conduct constitutes a violation and, if so, recommendations regarding the sanction(s) to be imposed. A violation must be proved by a preponderance of the evidence: there is more evidence than not that the accused committed the violation. Any findings, conclusions, or recommendations must be based only upon evidence received at the hearing. The President or the designee then makes a final determination based on the report. The President's decision is final and may not be appealed. Service to the University or the community, training, counseling, or other remedies intended to discourage a repeat of the misconduct or as deemed appropriate based upon the nature of the violation. Consistent with California Education Code Sections 69810 et seq., scholarships, loans, grants, fellowships, and any other types of state financial aid given or guaranteed for the purposes of academic assistance can be conditioned, limited, canceled, or denied. A designated period of time during which the privileges of continuing in student status are conditioned upon future behavior. Conditions may include the potential loss of specified privileges to which a current student would otherwise be entitled, or the probability of more severe disciplinary sanctions if the student is found to violate any University rule during the probationary period. A designated period of time during which the student is not permitted: (i) on University Property or specified areas of campus. (See California Penal Code section 626.2. ); or (ii) to have contact (physical or otherwise) with the complainant, witnesses or other specified persons. A student who is suspended for less than one year shall be placed on inactive student status and remains eligible to re-enroll at the University (subject to individual campus enrollment policies) once the suspension has been served. Conditions for re-enrollment may be specified. A student who is suspended for one year or more shall be separated from student status but remains eligible to reapply to the University (subject to individual campus application policies) once the suspension has been served. Conditions for readmission may be specified. NOTE: Cal Poly, San Luis Obispo, requires a student who has been suspended for three or more consecutive quarters to reapply using a streamlined process. Consult the Admissions Office for additional information. Permanent separation of the student from student status from the California State University system.